Two days after the Louisville Athletic Association’s board canned men’s head basketball coach Rick Pitino, the university’s board of trustees voted Wednesday to fire athletic director Tom Jurich with cause. The move comes in light of the FBI investigation into college basketball’s recruiting process—specifically, Jurich and Pitino were pushed out after the FBI publicized Louisville’s partnership with Adidas, one that allegedly resulted in Adidas and Louisville paying high school recruits to play for the Cardinals. Both Pitino and Jurich, whose daughter works for Adidas, denied any prior knowledge of these payments, with Jurich also refuting Louisville interim president Greg Postel’s claim that he had negotiated the school’s recent $160 million deal with Adidas without properly informing Louisville officials. The school initially responded to all this by placing the pair on administrative leave, then used its two voting bodies to remove them from their posts this week. We are disheartened by the actions taken by the University of Louisville Board of Trustees this afternoon against Athletic Director Tom Jurich. We believe that their vote to terminate his contract was done in haste with inaccurate information that should have had no bearing on continuing his employment. Tom Jurich maintained a professional athletic department that was the envy of universities across the country. He has done nothing illegal, nor violated any NCAA rules. Tom has been a great steward for the University of Louisville Athletics brand. Tom Jurich has always placed the care and well being of the student athletes first. Tom continually demanded that his coaches follow the rules of the NCAA and the institution and never once waivered in support of those who did. The Jurich family would like to thank the senior staff, coaching and department staff, student athletes, colleagues at UofL, donors, fans and everyone who live and reside in the city of Louisville for the opportunities and support they’ve provided throughout the years. With that said, Tom has instructed us to vigorously defend his rights and reputation under his long-standing contract with the University of Louisville. Jurich did not attend Wednesday’s meeting; his four-lawyer legal team was reportedly granted 15 minutes to make their case for the embattled athletic director. After putting off the vote while the board addressed a litany of other items, the call for Jurich’s firing came around 4:30 p.m. Despite a strong push from current Cardinals coaches, boosters, and university donors to reinstate Jurich, only three of the 13 board members voted against his firing: Brian Cromer, Diane Medley, Ron Wright. The remaining 10 members, including Papa John Schnatter himself, all voted to oust the 61-year-old administrator. Until they find a replacement, Louisville’s athletic director position will be filled by interim Vince Tyra. Jurich led the Cardinals athletics programs for two decades, during which time he oversaw massive stadium construction projects, hired Pitino to helm the basketball program, and played a key role in transitioning Louisville’s athletic programs from the Big East to the ACC. 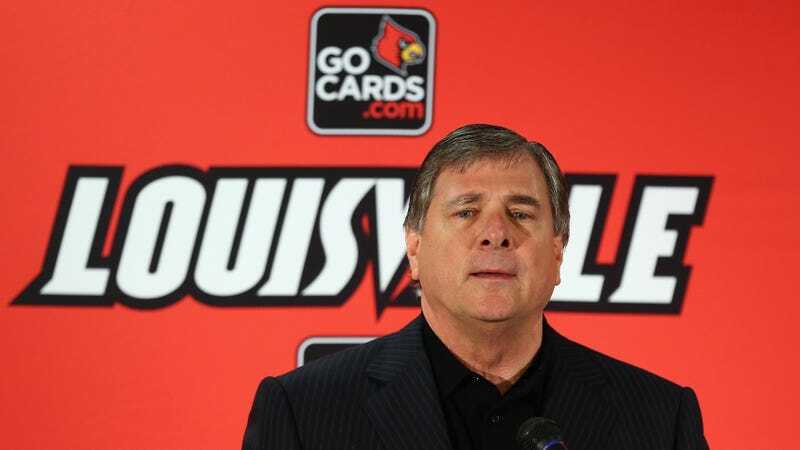 Given Louisville’s widespread success across its men’s basketball, women’s basketball, football, and baseball teams, Jurich was regularly regarded as one of the nation’s top athletic directors before the FBI announced its investigation. As intimated by his legal team’s statement, Jurich is expected to take legal action to fight the school’s claim that his firing was for a just cause; the for-cause firing frees the university from paying him the remainder of his sizable contract. While I doubt it will top Pitino’s pending claims of emotional distress against Adidas, the discovery process in this suit, and the burning of 20-year-old bridges Jurich built since he took over, should make his exit a bleakly entertaining shitshow.